After writing here only a couple of weeks ago that I never want to read Shelley, I found myself stopping at this poem this morning. I don’t think I’ve read it since I was an undergraduate and can’t remember reading it at all, yet it is one of those poems that has passed into my consciousness – I seem to know it. Yet the anger arrested me, perhaps because I already have it in me. Not many poems are angry. Or rather, I do not read many angry poems. Yesterday I read a lot of poems by Denise Levertov that were angry about the Vietnam war. Most war poems are angry. For me, poems about social injustice do not seem to work, they become trite, you get propaganda or party lines. But today Shelley’s spitting anger seems the right feeling. Like many people I cannot get the Grenfell Tower tragedy out of my head. I recommend listening to Sir Michael Marmot on yesterday’s Radio 4 Start The Week. Marmot talks about life expectancy in Kensington: the difference between the wealthy south of the borough and the impoverished north is 14 years for men. The average income for the borough is £125,000 but for half of the population it is below £35,000. All kinds of problems, social, physical, and mental follow these stats. Marmot says, just because we have the NHS offering treatment doesn’t mean that is the right way to go about things. In the case of a fire, we’d say, not we have to treat the results of fire, but we have to prevent fires. The same is true for heart attacks and mental illness. 6. strengthening the role and impact of ill-health prevention. So, back to work. I’m working on the second (and the fifth, and the sixth) of Marmot’s recommendations and must get back to it. Today’s poem is an important one for me because, quite aside from its moving power in its own right, it characterises my move from University English to Shared Reading and The Reader. I don’t say, as I nearly did, my move from the University to the real world, because a University is as real as anything else, and is certainly part of ‘the world’ – in fact you might say, the world is too much in them, to borrow and change a line from Wordsworth. Before, during and after University I was a personal reader, and for that I have to thank my outsider status and the Women’s Movement of the 1970s. ‘The personal is political’ was one of our slogans a key thought for me, and I took it with me when I moved away from the radical feminism from which I had gained so much. ( ‘War is Menstrual Envy’ was another slogan that I loved, for some reason particularly annoying my very few male friends). Being a ‘personal reader’ in a University English department in the period 1980-2002 was no mean feat. People were trying to make literature part of the social and political sciences, to make it inhuman, de-personalised (and therefore perhaps budgetarily defensible, not a softee humanities thing but hard as science, a brother to theoretical physics or plastics engineering). They were not happy times and I’m afraid the effect still lingers. I was lucky in that my teacher at University, Mr Brian Nellist (I had others, but he was The One, and you can meet him here) was an old-fashioned non-theoretical reader, and he encouraged me to be one myself, and to read as myself, rather than always in terms of women and men. Though by then, I had stopped being motivated by gender inequality. Perhaps need to think more about that another time. I did not have a Theory of Reading. I did not want to be self-conscious about my reading, I just wanted to read literature and see what happened, what I could learn, what touched me, what I cared about. Brian encouraged me, both as my third year tutor and as my Ph.D supervisor to to do that, finding out stuff that was useful and interesting to me. Essentially, he laid out this huge buffet of literature and said let’s walk up and down this, and see what strikes your fancy. Even so, what happened was at a formal distance. I’d like to think more about what that means another time. But to the poem. When I first began to have the idea of taking ‘great literature out of the university and into the hands of people who need it’ (not a snappy slogan but mine own) I had no idea of the power of the stuff I was going to unleash. Despite reading personally myself since I was child, and despite having chosen pieces that I thought most adults would find moving, I wasn’t prepared for tears. In nearly twenty years in the University, I had never seen anyone moved to tears by a poem. In the very first shared reading groups, which were called ‘Get Into Reading’ (there were two, on different days of the week, one at Ganneys Meadow Early Years Centre, on Woodchurch Estate, and one at the Community College on Laird Street, Birkenhead. Both mixed, open community groups) and before that, before 2000, in the prototype experimental groups I ran before the Get Into Reading , which took place in St Cath’s Hospital Birkenhead and in Waterstones, Bold Street, Liverpool, I read this poem. In each group as I read, someone was moved to tears. In Waterstones’ after work reading group, a nurse who had come straight from Arrow Park hospital filled up with tears as I read. She said it was the line, ‘But such a tide as moving seems asleep’, which had got to her, because her Dad had died when she was a teenager, and when he was alive they used to walk sometimes along the riverside and the tide…poetic image and reality had crashed together for her. Nothing has ever put it into words, she said, as if seeing ‘ it’ in words had caused the release of tears. There are things you need to know (what a bar is, how it functions, what a pilot is in harbour terms…) to understand the poem but like all great poems, it doesn’t matter if you don’t know them. The music of the poem will carry most listeners far. What is interesting to me as I look at it this morning is how Tennyson, writing about death, (all the people who cried in those early groups spoke of someone they loved who had died: the poem seemed to speak to them of particular deaths) is actually writing about, anticipating, his own death. Yet the poem reads – sounds – like an elegy for another. Or perhaps it simply touches all death by thinking of one particular one. As I read these lines, they are coloured for me by the people I have read the poem with over many years – the nurse (cannot remember her name) and Dorrie at Ganneys Meadow and a young woman with blond hair in the Laird Street group, and others. I think also of my own death – so much closer now that when I read the poem in Ganneys Meadow, and the need for ‘no moaning’ seems more real and more pressing. Of course, ‘moaning of the bar’ in purely linguistic terms may be the noise made by waves crashing against ‘the bar’ – the sandbar built up by currents in a harbour mouth or estuary… but is anything in a poem ever purely linguistic? A word in a language is like a bundle of sticks, a bundle of meanings (whose thought is this, please?). We put the sticks in the bundle according to our experience, memory. So I may partly think of waves crashing far out in the estuary, partly of my own complaining, partly of the sobbing of a bereaved friend. The poem, for all its sadness, is a brave one. ‘when I put out to sea’ does not feel like the end but rather a beginning. It is a brave setting out on adventure, however terrifying. The fact that the first two stanzas are one sentence seems to matter – there is no full stop after sea, but thethought caries on, after the line ending, after the ending of the stanza. and the second stanza is full of comfort. But it is time to stop! oh dear. More tomorrow. Today I’ve got a piece in the Comment section of The Observer about why we need a reading revolution. In it, I remember seeing a baby, one of those gorgeous chunky one-year-olds, leaping up in his mother’s arms on a doorstep in North Birkenhead and thinking ‘that baby will never read Wordsworth’. That thought (or was it a feeling?) helped propel me into creating The Reader. But why, in a hard life, and that baby’s was almost certainly going to be a hard life, would Wordsworth matter at all? Why not concentrate on housing and vegetables? Of course, we need those things but as Rose Schneiderman famously said, we need bread and roses. And we need them at the same time. Humans have inner lives and those inner lives have profound effect on our ability to renew roofs and grow vegetables, to create a sour-dough bakery in an area down-on-its-uppers, to develop a rose-growing business out of a wasteland. If a person cannot ‘think’ with his thoughts, that is to say that he has thoughts but lacks the apparatus of ‘thinking’ which enables him to use his thoughts, to think them as it were, then the personality is incapable of learning from experience. This failure is serious. Failure to eat, drink or breathe properly has disastrous consequences for life itself. Failure to use emotional experience produces a comparable disaster in the development of the personality. The World Health Organisation tells us that depression is the leading cause of disability worldwide. We are failing to learn from our own emotional experience partly because we do not have the language to think about it; at best we talk about this stuff in terms of ‘mental health’. But we should be speaking of ‘human experience’. That’s why we need great literature – Wordsworth, Kate Beaton, George Herbert, George Eliot, George Saunders, Frank O’Hara, Frank O’Connor, Frank Cottrell Boyce, Anton Chekov, Jeanette Winterson, Tolstoi, Dave McKee, Shirley Hughes, Nathaniel Hawthorne, Shakespeare, Jon Klassen, Marilynne Robinson and all the rest of them. We need great literature and we need to relate to it in a different way. Our current way organising education so often turns it into dead stuff, despite the best efforts of good teachers. Great literature isn’t dead, it is just waiting for readers to make contact. Pupils who are being taught there are correct answers are not readers, they are exam-passers. Though I felt massively excited by these lines, I did not ‘understand’ a word. I did not know what the ‘Tree’ was. I did not know whether the ‘single field’ was real or not. I did not know why it was a ‘pansy’. Being moved, being touched, being excited in ways you don’t understand is what matters. It leaves you in a place where you can ask questions. And why is asking questions good? Because that’s how we learn! I did not know what ‘the visionary gleam’ was but I knew I knew about its absence. I did not know what ‘the glory’ was, nor ‘the dream’ neither, but I knew I missed them both. The words spoke to some feeling I had and did not understand. The feeling was about ‘something that is gone’. There is no amount of on-curriculum study that would have made any of this clearer to me – I had to absorb the questions and realise, over years, that they were clues to hard-to-reach parts of my self. I’ve been reading this poem for thirty-six years. It still works, I still don’t understand it, it still gets me to ask questions! What we’ve found in sixteen years of Shared Reading is that working out feelings and language with other people is easier than doing it on your own. I am grateful to the University curriculum for making me read Wordsworth and I’ve tried to translate that into Shared Reading (don’t just read what you already know and like). Without that looming second-year course on Romantics I’d never have read Wordsworth of my own volition, because it was too far, it seemed from my own experience. But that’s the thing about great writing, it is never far from your own experience. That’s what makes it great. Erwin James is a Guardian columnist and author, a trustee of the Prison Reform Trust and a Patron of The Reader. Redeemable, his memoir, builds on and expands what we know of him through his two collections of essays, A Life Inside: A Prisoner’s Notebook and The Home Stretch: From Prison to Parole. Erwin is a convicted murderer who spent twenty years in prison before his release in 2004. You can read his remarkable essay on the power of reading in The Reader magazine, number 54. Though I knew it would be a sad, hard book, I had been longing to read Redeemable, because Erwin is a remarkable man, and because ‘how do people change? ’ has been one of my key obsessions for thirty years. As I write these life-size numbers – twenty years, thirty years – I feel both how long and how short are these lives I am reading and thinking about. It is this deep blankness is the real thing strange. Tell or remember even what they were. The contradictions cover such a range. The talk would talk and go so far aslant. You don’t want madhouse and the whole thing there. It is as if, even now, after all this thinking and sifting and remembering, Erwin cannot fathom his father, whom he loved, loved, loved. But why, after his wife’s death, did Erwin Snr continually abandon his children? Why did he beat his little son? It’s as if Erwin has, in the end, simply to let it go, ‘the contradictions cover such a range’. There are no answers and no time for answers in the first two-thirds of the book, which feels a rushing headlong descent towards the newspaper clipping that gives the bare, public details of Erwin’s trial for double murder. Erwin mentions reading Crime and Punishment in prison many years later, and I felt as I read, that the world of Redeemable was lit by the same feverish pained misery as Dostoevsky’s novel. So, as a twelve-year-old, Erwin is living in children’s home when he gets into a fight at school and runs away, from Ilkley to Shipley, an eight mile walk, to the place he thinks his father is living. His father’s girlfriend won’t let him stay and sends him on to Aunt Bridie’s house. She told me where my aunt Bridie’s house was and said that Maw (Erwin’s much loved grandmother) was staying with her and my uncle Jake. Bursting with excitement I sped off to find them. The house was at the top of the estate, the very roughest part where houses had windows missing and holes in front doors. When I arrived I banged on the door as loud as I could. I cried with joy when I saw Maw and rushed to her, grabbing hold of her and sobbing into her arms. ‘Oh, son,’ she said, ‘look at the size of you!’ I hadn’t seen her since a few weeks after the crash (in which Erwin’s mother was killed) more than five years earlier. She looked very old and not at all well. She had a great blue and black bruise on the left side of her face. ‘Don’t worry son,’ she said when I stared. ‘I just fell doon the stairs when I was tired.’ I could smell alcohol on her breath. Around the room I saw empty beer and wine bottles and realised that Maw, Aunt Bridie and Uncle Jake were all drunk. The police picked me up in Shipley town centre two days later and after a couple of hours in the police station I was taken back to the Home. And so it goes on, the unstoppable blur of drunken faces, robberies and runnings-off that make up this child-and-early-adulthood. At one point in the week, Redeemable is in my mind as I watch a young mother playing with her three-month-old baby. The mother is holding the baby about ten inches away from her face, completely focusing the child’s attention. The mother smiles and talks, nodding, making deep contact. ‘Aren’t you a lovely one, you are, aren’t you?’ She pauses, waits patiently, holds the child, and continues to nod and smile. In response, the baby smiles and coos, almost, you’d say, speaks back. They talk to one another, communing, communicating for ten, fifteen minutes as I watch. I’m thinking of Wordsworth’s Prelude where in Book 2, the babe ‘nursed in his mother’s arms…doth gather passion from his mother’s eye.’ Wordsworth observed, as psychologists and baby-watchers have done, that the baby recognises its feelings in the faces of others, and gradually learns through language to name those feelings. Language is what we use to communicate between inside our wordless, feeling-driven selves and the outside world of everyone else. Language is what we have to help us become part of humanity. Language and role-models, as William Blake knew. His poems Infant Joy and Infant Sorrow give us the psychology in two tiny nutshells. Erwin, like many children who fall into the Care system and later into prison, doesn’t have much in the way of role-models (though he loves reading and writing and, a school failure, loves English). He learns what his family teaches him: to love without hope of love returned, to drink as a way to escape the pain of being unbeloved, and to hurt others as he has been hurt. Care teaches him nothing but that he is a criminal. It is only when he is convicted and meets the patient, one might even say loving, psychologist, Joan Branton, that you feel the human exchange, the eye contact, the focus, the shared language of feelings begin to enter his consciousness. He is no baby: he is twenty–eight years old. But Joan gives him time, conversation, books, including Crime and Punishment. ‘What have you done to yourself?’ Sonia the prostitute asks Raskolnikov the murderer in one of that novel’s culminating moments. This is one of the questions Joan invites Erwin to consider. Highly recommended, but it is a hard read. Have tissues and time to recover. Then send some books to prisoners or support the work of The Reader in prisons and other criminal justice settings. The Reader’s Shared Reading model gives people in prison an opportunity to think about their lives and the lives of others through the medium of literature. We run shared reading groups in a number of criminal justice settings across the UK. We are glad to have recently won the first ever public tender for a shared reading contract, which will provide shared reading in all Northern Ireland Prisons. Jeanette Winterson’s memoir, Why Be Happy When You Could Be Normal? (Jonathan Cape, 2011) relates the story of her suicidal breakdown and subsequent search for the truth about her birth mother. It is also an account of a life shaped and given the deepest of meanings by books. As with Jeanette’s favourite Shakespeare play, The Winter’s Tale, the book falls into two halves separated by a wide and untold gap of time. The opening chapters detail the reality of the life that gave rise to Winterson’s stunning first novel, Oranges Are Not The Only Fruit. Then, following a short intermission, the book flashes forward twenty-five years to 2007, when Jeanette accidentally uncovers her own adoption papers, and begins the painful and testing process of discovering her origins. I met Jeanette in Manchester for a conversation about the book in October 2011. What follows is an edited transcription interspersed with extracts from the book. This interview was originally published in The Reader magazine no. 44. Jeanette, one of The Reader’s Patron’s, is coming to Liverpool to visit the International Centre for Reading at Calderstones and to help launch a new University of Liverpool research group Mental Health in Context. The launch event (book here), 21 April will showcase real-life research in vital areas of human well-being. JW: The trouble is everything takes a lifetime, which I think is the best argument for something of us continuing after death. Surely you can’t just work a thing out and then stop it? Nature doesn’t do waste, does she? My time was up. That was the strongest feeling I had. The person who had left home at sixteen and blasted through all the walls in her way, and been fearless, and not looked back, and who was well known as a writer, controversially so (she’s brilliant, she’s rubbish), and who had made money, made her way, been a good friend, a volatile and difficult lover, who had had a couple of minor breakdowns and a psychotic period, but had always been able to pull it back, to get on and go forward; that Jeanette Winterson person was done. In February 2008 I tried to end my life. My cat was in the garage with me. I did not know that when I sealed the doors and turned on the engine. My cat was scratching my face, scratching my face, scratching my face. JD: Tell me about your cat. Spikey. He’s more like a dog. I’ve got two cats, Spikey and Silver, and they’re my personality chopped in half. One of them is really outgoing, loves me and loves visitors, and the other goes ‘Oh my God, not another person, please!’ That’s totally me in the cats. It was incredible that the cat was in there because without him I wouldn’t be talking to you. The attempt would have worked, no question. He hates me going away. He sleeps on the bed and sits in my study and works with me. He looks out for me. You know in the fairy stories there’s always an animal helper – that’s what I got. Just at the minute when there was nothing else, and your brain can’t save you, and your friends can’t save you, and certainly you can’t save yourself, there’s the animal helper. You’ve written a profoundly religious book. [JW looks aghast] In the sense that the whole story is a story of love. I am sure that love is the highest value, I do believe that: it is the only thing you can set against the devouring principle, which rules so much else in our lives. We have to eat to live and that becomes its most grotesque with consumerism and the raiding of the planet that we do. We’ve never got a balance with our devouring instincts and I think the only thing that we do set against it is love acting as a check to say ‘No, I won’t take this, I won’t eat this, I won’t have this. I will give to this instead’. I have the feeling that the garage was a kind of rebirth or transformation. You use the word ‘done’ – ‘My time was up… that Jeanette Winterson person was done’. Yes. It’s odd those things stacked in the word. Done in, done over, done for. Oh yes, it is fixed and people who have known me for a very long time do say ‘Yes, something enormous did shift’. Of course, the same old stuff goes on, but I know I’ll never end up in the garage again. It’s completely clear in my mind – I will die of natural causes or from something out there in the crazy world, but it won’t be anything to do with me. That is ‘done’. This now feels like a whole new chance and another set of things to get on with. I don’t know where it’ll take me but things have changed for me. I feel much more open, both forgiving of others and forgiving of myself, of how I used to be. There are points in your life where you can see ‘I needed that then’. I would never have escaped Accrington if I hadn’t been full of a sort of Protean energy and I was ruthless. I thought ‘I’m not staying; you’re not crushing me. I’m going’. I had to have enormous energy and self-belief to do that. But what’s interesting is that then life will still offer you another challenge, that you’re not done. That was a big shock. I love the way you leave out those twenty-five years. Good! That’s fine. Who the hell could bear to go through all that again? I didn’t want the book to be that kind of story. What interests me is that in our lives things don’t lie side-by-side chronologically. They lie side-by-side in terms of their emotional effect, their weight, and what they mean to us. It’s not to do with the calendar in any straightforward way. I wanted to show that in the book. It’s a memoir but its also a story and this story is, amongst other things, about the overwhelming absence of one mother and the overwhelming presence of another. It has a certain linear trajectory but in fact life doesn’t finally work that way – it’s not linear and so the bit in the middle – those twenty five years aren’t relevant to this story. So I thought, why can’t I leave it out? I think that was right because what we want to know is where we go from there. The missing part is really the outworking of where I got to. I got there and I won some grace and I won some time, and went off and I did something with my life. And then it all ends up in a garage. It all ends up in the garage! And with no choice because – you don’t choose it. You think from time to time, I could do this, and I think that is quite freeing. I don’t think suicide or contemplating suicide is necessarily negative. Depending on the kind of person you are, you need to know that it’s an option. I did. And that was useful for a while because I think the thought stopped it from happening but then there’s a point when you’re not thinking any more, and the psychic pain and the emotional pain is so overwhelming that – well, you’re not thinking, you’re simply trying to exit. It isn’t rational. And no matter how smart you are, no matter how cared for you are – you know, I wasn’t somebody with no friends – there’s a moment where you cannot do it any more. I had to arrive there but by some good grace I was able to get through it. There are so many fairy stories – you know them – where the hero in a hopeless situation makes a deal with a sinister creature and obtains what is needed – and it is needed – to go on with the journey. Later, when the princess is won, the dragon defeated, the treasure stored, the castle decorated, out comes the sinister creature and makes off with the new baby, or turns it into a cat, or – like the thirteenth fairy nobody invited to the party – offers a poisonous gift that kills happiness. This misshapen creature with its supernatural strength needs to be invited home – but on the right terms. Remember the princess who kisses the frog – and yippee, there’s a prince? Well, it is necessary to embrace the slimy loathsome thing usually found in the well or in the pond, eating slugs. But making the ugly hurt part human again is not an exercise for the well-meaning social worker in us. This is the most dangerous work you can do. It is like bomb disposal but you’re the bomb. That’s the problem – the awful thing is you. It may be split off and living malevolently at the bottom of the garden, but it is sharing your blood and eating your food. Mess this up, and you will go down with the creature. And – just to say – the creature loves a suicide. Death is part of the remit. I am talking like this because what became clear to me in my madness was that I had to start talking – to the creature. Could you tell me about ‘the creature’? Oh yes, me and my creature. I was wandering about and we were shouting at each other. It was good to split the creature off. In technical terms I was crazy because I was talking to a split-off manifestation of myself that seemed real. As far as I was concerned, it was real, so it was a psychotic episode. But I think R. D. Laing’s right about that – you sometimes have to have psychotic episodes and not drug them into oblivion, and not be so scared that you can’t go through them. It is a huge risk but you have to take the risk because if you do medicate it or you fail it in any way it’s almost certain that it will kill you in the end. A lot of people give up at that point. They don’t want to talk to the creature. They want to say, there is no creature. That kills you. It does. Either you become a Stepford wife or it’ll kill you. That’s the alternative. And I think our world gets in the way of people going through the process. There’s no space for it, and everyone’s terrified of it, and that’s why they thrust the pills at it. That’s why I didn’t go to the doctor. I felt I’ve got no chance if I walk in that surgery; it’s going to be on my records. I was certainly lucid enough to work that out. So I went to therapy and she didn’t. Pointless. It wasn’t all pointless though, because after therapy, in Oxford, I was always so fed up that I went down to Blackwell’s bookshop, and down to the Norrington Room, looking at the psychoanalysis shelves. The Norrington Room is a serious place – designed for the university, and stocking every text on brain / mind / psyche / self. I had been reading Jung since 1995 – I bought the whole hardback set. I already had the whole hardback set of Freud, and I had always read Mind Body Spirit stuff, because if you are raised on the Bible, you don’t just walk away, whatever anybody says. Now, I was looking for something, and I found Neville Symington, a priest turned shrink, who had a simple direct style and was not afraid of talking about the spirit and the soul – not as religious experiences but as human experiences – that we are more than body and mind – and I think we are. Symington helped, because I was getting well enough to want a framework in which to think about what was happening to me. Previously I had been holding on to the side of the open boat that was my life, and hoping not to drown under the next wave. Occasionally the creature appeared when I was reading, to mock me, to hurt me, but now I could ask her to leave until our meeting the following day and, miraculously, she did. It was summer. The Battle of The Sun [a children’s novel JW had begun during the breakdown period] was nearly finished. I was lonely and alone, but I was calm and I was saner than I have ever been, insomuch as I knew there was a part of me that was in madness. Symington talks about how the mad part will try to wreck the mind. That had been my experience. Now I could contain it. A few months later we were having our afternoon walk when I said something about how nobody had cuddled us when we were little. I said ‘us’ not ‘you’. She held my hand. She had never done that before; mainly she walked behind shooting her sentences. We both sat down and cried. I cried from about page 170 onwards and I cried most at the point where you are finding out what your original birth certificate says, finding out who you are… You say ‘Susie held me’. Would any of this have happened without your partner, Susie? No, I would have lost heart, I wouldn’t have been able to nerve myself up to it because there are so many hurdles. At some point I would have thought, I can’t do this. You write ‘She’s smiling at me as the meeting begins and saying nothing, holding me in her mind. I could feel that very clearly’. So that’s where I began to cry, because I suppose all of this last bit is connected to you finally being a baby and letting that baby be loved. I’m interested in the fact that the story comes here now in this format – memoir – because I think you’ve written it in it lots of ways, or parts of it, in your novels. You’ve always been writing it. But here it seems really different and it feels like a breakthrough because it’s able to use very straightforward, ordinary language ‘holding me’. It’s simple. Anybody could read this. That felt to me like a religious / spiritual / psychological / intellectual or artistic breakthrough that was to do with being able to give and receive that love, being able to be held. I think that’s probably true. I’ve always used the first person, which is unusual for a writer older than 25 years. I don’t like the third person very much, although oddly I do use it in my children’s books. What that’s about I don’t know – there’s some shift there. But I think, this has taken a long time to move towards. I guess it was partly to do with my god-children with whom I’m very close and partly to do with everything that was leading up to this moment of seeing the birth certificate. That’s the thing. It takes forever to get somewhere and then it happens with an inevitability, as though you were always going to get there. I think, insomuch as I’m alive, this is where I was going to get. Either I was going to die because I couldn’t go any further or, having survived, I was going to be able to do this. The moment where you are given the piece of paper with the names on it and you describe them as like runes… It’s hard to read, so painful. It’s the name of your birth mother and this is your original name: ‘I am standing up. I can’t breathe. Is this it then? They’re both smiling at me as I take the paper over to the window’. At that point, that’s where I was in floods of tears. It felt like a birth. It felt like being present at a birth. It’s true. I suppose they were both the midwives. No. I have never felt wanted. I am the wrong crib. No. And all my life I have repeated patterns of rejection. My success with my books felt like gatecrashing. When critics and the press turned on me, I roared back in rage, and no, I didn’t believe the things they said about me or my work, because my writing has always stayed clear and luminous to me, uncontaminated, but I did know that I wasn’t wanted. And I have loved most extravagantly where my love could not be returned in any sane and steady way – the triangles of marriages and complex affiliations. I have failed to love well where I might have done, and I have stayed in relationships too long because I did not want to be a quitter who did not know how to love. But I did not know how to love. If I could have faced that simple fact about myself, and the likelihood that someone with my story (my stories, both real and invented) would have big problems with love, then, then, what? Listen we are human beings. Listen, we are inclined to love. Love is there, but we need to be taught how. We want to stand upright, we want to walk, but someone needs to hold our hand and balance us a bit, and guide us a bit, and scoop us up when we fall. Listen, we fall. Love is there but we have to learn it – and its shapes and possibilities. I taught myself to stand on my own two feet, but I could not teach myself how to love. We have a capacity for language. We have a capacity for love. We need other people to release those capacities. In my work I found a way to talk about love – and that was real. I had not found a way to love. That was changing. I am sitting in the room with Susie. She loves me. I want to accept it. I want to love well. I am thinking about the last two years and how I am trying my best to dissolve the calcifications around my heart. Ria smiles and her voice comes from a long way off. All of this seems too present, because it is so uncomfortable, and too far away, because I can’t focus. Ria smiles. In the economy of the body, the limbic highway takes precedence over the neural pathways. We were designed and built to feel, and there is no thought, no state of mind, that is not also a feeling state. Nobody can feel too much, though many of us work very hard at feeling too little. Well, I find it so. Had place that moment, and altered all. It was a poem I had learned after Deborah left me, but the ‘great going’ had already happened at six weeks old. The poem finds the word that finds the feeling. There’s a terrible bit at the end of the book where you say ‘The baby knows’ – about the loss of mother, everything, the adoption. Yes, I think the baby knows. You know that something has gone very wrong. I wonder, and I don’t know about this, but I wonder if that absolute change for the baby prompts language early because that bit of your brain has to develop. You’re desperate to understand what’s going on around you. What am I going to do? I was talking about it to A. M. Homes in New York last week – I love her work. She wrote a memoir about her own situation called The Mistress’s Daughter. Her father had a baby with another woman and that was her, and she was adopted. She thinks that when you do your search later it activates all this stuff which is in fact DNA material. She thinks it releases a chemical change because you’ve had to store this feeling or information. I asked her was she very precocious with language? And she said yes she was. You’re seeking some explanation for why you suddenly land up in this place with all the wrong smells and the wrong person, so it may be so. We’re evolved to survive aren’t we? What you’ve just said has made me think about dying and what you said at the beginning about ‘Why have all this and waste it?’ Being born and dying are the big acts of change. I don’t think I know anyone who has died well. Well, I’m going to. There’s a great bit in Virginia Woolf, I think it might be in Between the Acts. Never having thought about death or dying before, the character suddenly sees it like a shark’s fin out at sea, far, far away, and thinks ‘What’s that?’ and then, of course, the fin is coming closer and closer in to shore. It’s a nice way to describe the moment because you don’t think about dying and then suddenly you do think, ‘What’s that?’ and you realise it’s mortality, and then you realise that it’s my mortality. They come back. So I just wonder whether that thing about before we’re born whether we have some kind of consciousness of where we are even though we’re not here yet. Wordsworth says our birth is a sleep and a forgetting. If our death is something like that, I feel very glad for you that you have had your thing in the garage and now this time afterwards. There’s a real chance now for what happens in the second half to be freer, more creative. Well, I think it’s going to defy the odds, actually. The cliché, and art’s meant to be a cliché, is that then there will be a steady decline. Don’t you think that Ted Hughes’ Birthday Letters reinvented him? And then he died. It may be different for women because as we get older we tend not to turn into little tin gods, even if we’ve had some success, but men do and then they become ridiculous. They get all the praise, all the prizes, all the money, they don’t ever have to do anything ever again really. And so they don’t. It’s easier for men to become rigid. But for women because nothing is ever safe, or ever secure, or ever certain, because gender politics are still at play, it may be that for that reason and also because women, like it or not, are in charge of birth, and therefore rebirth, we may be better equipped for the second half of life and all that it means. The main thing I want to say is, you’ve been fantastically brave. It’s a very brave book. My degree, First Class honours, top of my year, was the first success I had had in the world. I was a not-very-mature mature student about to start her adult life. The day the results came out my ex-partner committed suicide. I had ended our relationship – which involved a lot of drugs and drink – so as to be able to concentrate on my degree. I was left with a terrible sense that I had to make my life count for something – that the thing I had chosen, ‘literature’, had to pay. Within 3 years my mother would die of alcoholism. These two deaths were utterly significant in the much later development of The Reader Organisation. They seemed to stack up an equation – what life is, and how you value it, what matters, what things cost. In the pub garden that sunny day, Brian persuaded me that instead of becoming an adult literacy tutor, I should do a Ph.D. I took his advice and the three years I spent writing my thesis, Visionary Realism: from George Eliot to Doris Lessing laid down the foundations of my adult life. I became a university teacher of literature. My desire to ‘teach adults to read’ stayed stubbornly put, however and I taught Adult Continuing Education for the next 20 years. I had no ambitions and absolutely no sense that I could affect the world in any way, nor would I want to. I thought the world wasn’t very good, and I didn’t respect it very much. As I look at memories of what I felt at that time, it seemed that the most important thing was to make a small good world around myself, immediately – in my house, with my family, in classes I taught. That was the world I could affect. I had to make my own life pay – I felt – for those two lives which, if I had if not actively taken, I had not been able to save. This has always been at the back of my sense of my own adult life and behind my teaching or sharing of literature. Can it help? For a long time, I wanted to be a writer. Finishing my Ph.D. had taught me that I could complete things, so for many years each day I got up at 5.00am and wrote. I wrote six novels during this period, none of them publishable, but all important to me: I was remaking the world in images I chose. I wrote stories of people whose lives had been smashed up, whose worlds were broken. And then I taught literature, part-time, to adults. Being an unpublished novelist was a sad state (though I didn’t care a jot for a long time: I just had to write), but it served as a sort of preparation for the hard slog that would become The Reader Organisation: I was learning to believe in and to build structures. It was a fifteen-year apprenticeship in not giving up. He is my refuge and my fortress: my God; in him will I trust. and from the noisome pestilence. his truth shall be thy shield and buckler. nor for the destruction that wasteth at noonday. I did not, do not, ‘believe in god’ in any sense that a person with a formed religious faith would recognise. Yet I needed those words – ‘fortress ‘ ‘deliver thee’ ‘snare of the fowler’. The words met me in my place of terror and offered –what? Recognition? Language? They are ancient words, words to which people, for more than two thousand years, have turned in their terrors. Unable to sleep, I took comfort from those countless human beings, and the words to which they had turned. The verses seemed to offer structure, shape, and yes, refuge. I liked reading them aloud. They gave me, in the deepest sense, comfort. And it was a surprise – I had no idea those poems, The Psalms, were still alive. Many other books also helped me – the entire works of George Eliot (including the nine volumes of her Letters). Shakespeare. The Assistant by Bernard Malamud. Shikasta and The Sirian Experiments by Doris Lessing. The works of Russell Hoban. Poetry, starting with Chaucer and going as far as my dear old friend Les Murray’s An Absolutely Ordinary Rainbow, and probably further. George Herbert. Paradise Lost. The Prelude and everything else by Wordsworth. These books gave me back my inner and outer experiences in words and sentences, feelings and thoughts, images, worlds, cosmologies, voices, languages. They gave me meanings which matched what I already – wordlessly – knew. The Reader Organisation has grown out of and from the wonderful compost of sadnesses, ruins, breakages, losses and terrors of my own real life and the lives of others I have known. When I started my mission (‘great books out of the university and into the hands of people who need them’) in 2002, it was with the intent of passing on this strong, life-saving stuff to others. Having felt the true weight of the trouble many humans, most humans, have to live through, the seriousness of needing some strong help really comes home. Of course there is lightweight reading, and some people are lucky enough to live on the surface most of the time. Let them continue to bob along happily, reading for pleasure. But many of us are shipwrecked, drowning. We are reading, like the child Davy in David Copperfield, ‘as if for life’. Is that reading for pleasure? Is it bibliotherapy? These are not the right words but no matter, so long as they bring us what we need. We need lifesavers, the great books. We combined ThinkDay with Sportsday, as we have a garden at Calderstones Mansion. 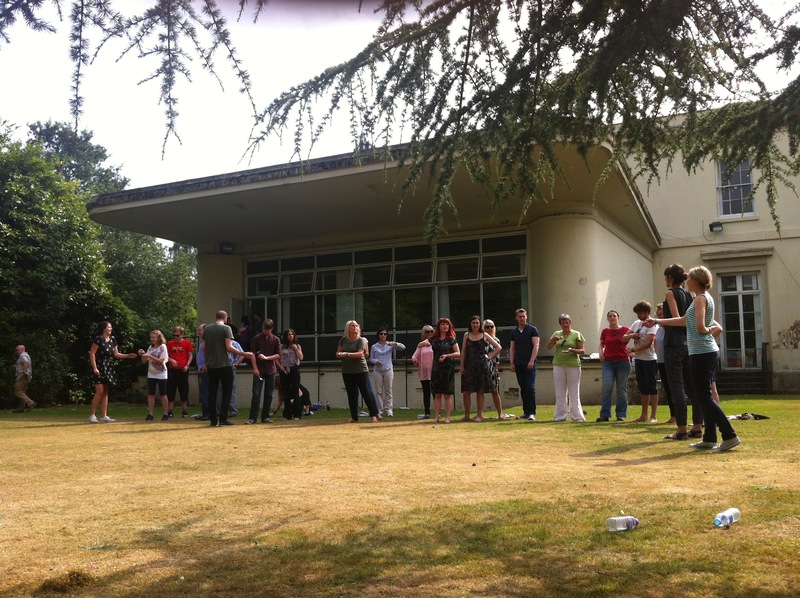 Picture shows Team A lining up for their innings in a very competitive game of rounders. The Institute of Education’s recent report into Reading for Pleasure indicates that reading for pleasure between the ages 10-16 affects cognitive power, giving readers better results even in non-language based subjects such as maths. The study allows for socio-economic influences, and seems to point to reading for pleasure as a greater indicator of educational success that whether or not your parents went to university. It looks as if it comes down, causally, down to increased vocabulary. Or is that a outcome of something else? I was delighted to receive a copy of the draft report from Dr Alice Sullivan, and I’m looking forward to giving it my full attention over the coming weekend. My initial scanning glance set a couple of thoughts off . First, is it about vocabulary – greater power to communicate – or is that a sign of some other, deeper, structural development? Need to read the paper properly to see what the researchers are saying. and secondly, do we have to call it reading for pleasure? I have reluctantly accepted this misnomer for years, simply because there seems no other word or phrase for it. But ‘pleasure’ is not good enough. I read pleasure as ‘trip to Alton Towers’ (though have to admit, I’ve never been). But reading is more like ‘expedition to Kilimanjaro’. Would you call that order of experience ‘pleasure’? Pleasure may be in it, but there is also trial, testing, pain, failure, exhilaration, defeat, new start, amazing sights, bleakness, terror, joy etc. Alton Towers is a cheap simulacrum. So what is the word for what we do when we read hard stuff ? And why, uncompelled, would anyone read the hard stuff? For more than twenty-five years, while I was studying and teaching literature, my job was to read, to think about what I had read, and to talk to people about that. It’s a terrible thing to admit, but I struggled to imagine why readers found it difficult to get into reading complex books, and sometimes thought it a failure of will: they just didn’t really want to. But here I am, wanting to reread George Eliot for the first time in seven or eight years, and finding it difficult to concentrate: hard paragraphs in Middlemarch shout less than the need to sort new staff contracts. I am going to have to devise some regular daily plan for attentive reading, because these days, like most other adults, I haven’t got the concentration at the end of the day. You might say, why bother? Isn’t the active life as important as the contemplative? Yes, and having founded The Reader Organisation – a great experiment involving people and books – I am choosing the active during this part of my life, and enjoying it, too. All the same I am beginning to feel the need for some element of the contemplative life. It might come from meditation, or study, or prayer or perhaps even as the by-product of a very long walk, but contemplation’s serious thinking, imagining and feeling also arises in the course of reading a complex novel or epic poem. This accosting kind of thought is a natural function of being human: babies and small children are concentrating in this way most of the time – building thought-models of reality. 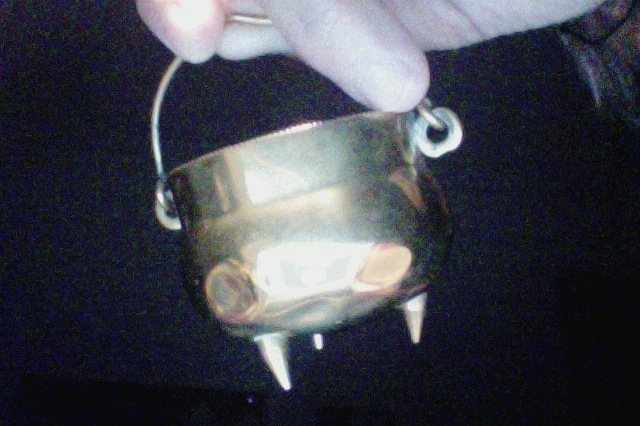 On the mantelshelf I have two brass cauldrons, about the size of small tangerines, gently dented by three generations of play. They have a minutely serrated rim, which you only become aware of when you pick them up. Holding one now, running my finger around that rim, I re-feel the pleasure I had in those serrations when the cauldrons sat on my grandparents’ mantelpiece. I also feel a sense of the mild fear I had of the legs of the things: sharp fat brass pencil points. Sniffing them, I remember their thin, high-metallic smell and I am back in the living room of my grandparents’ house, where we went after school for tea and stories and toast. We often had the light off, to save electricity. In the dark, the cauldrons shone in the light thrown by the coal fire. The happiness of seeing the bright light in the parlour at home, as the gig passed noiselessly over the snow-covered bridge; the happiness of passing from the cold air to the warmth and the kisses and the smiles of that familiar hearth, where the pattern of the rug and the grate and the fire-irons were ‘first ideas’ that it was no more possible to criticise than the solidity and extension of matter. the pattern of the rug and the grate and the fire-irons were ‘first ideas’ that it was no more possible to criticise than the solidity and extension of matter. There is no sense of ease like the ease we felt in those scenes where we were born, where objects became dear to us before we had known the labour of choice, and where the outer world seemed only an extension of our own personality; we accepted and loved it as we accepted our own sense of existence and our own limbs … And there is no better reason for preferring this (particular thing) than that it stirs an early memory; that it is no novelty in my life, speaking to me merely through my present sensibilities to form and color, but the long companion of my existence, that wove itself into my joys when joys were vivid. There is wonderful sense of what contemporary thinkers would call ‘wellbeing’ here: a sense of a unified life where feelings and objects and time are bound together in one person, through joy. I would never choose to buy these cauldrons in a shop. They do not speak to me ‘through my present sensibilities to form and color’; they are not my style. I love them partly because they are mixed with memories of my grandparents, of the fire, and the toast and their love, of things I felt when my joys ‘were vivid’. They give me that elusive thing: wellbeing. I am now the grandmother who has these cauldrons on her mantelpiece. My grandson (two years, nine months) is in the bath playing with a plastic tea-set. This is a creative experimental process and Leo is full of earnest concentration as he tries to float the cups and fill them with water, as he watches the water pass effortlessly through a sieve but less effortlessly through a small colander. His favourite word at the moment is ‘more!’ He wants things repeated ad infinitum because he needs to see them many times in order to establish them as realities, strong possibilities, likelihoods in his mind. This is a sort of scientific enquiry. ‘Not yet’ is a language spell that allows him to hold back the reality principle for a moment and continue what he is doing – and sometimes it works. But not now: our needs are more pressing; we want to eat. He’s furious when I lift him out, screams ‘Not yet! Not yet!’ over and over and finally subsides into body-racking sobs as his mother and I rub him down and get his pyjamas on. When we are in the bedroom, I offer a story and the sobs stop: suddenly everything is different. We open the book. It’s one of Jan Pienkowski’s Meg and Mog stories. The witch and her cat are making a spell but something is going terribly wrong. There are explosions. ‘Where’s Mog?’ I ask him and he points to the cat. ‘Where’s the cauldron?’ Leo points to the cauldron. ‘What’s Meg putting in the cauldron?’ I ask him and he recites the list of spell ingredients. He is altogether caught up in the discovered world. In the bath-experiment, Leo was actively manipulating objects and forces – water, gravity, plastic. While part of his intelligence was involved in creating the experiment, part was engaged in observing it and another part in thinking about it. But with the book there is nothing for him to do physically, the concentration is total: all his energy goes into the observing and thinking about what he is observing. The book it is all here: the pictures and words present a created universe with experiments going on (as in George Eliot). What we have to do – our part – is to observe, meditate, reflect. Well, my dear reader, Leo in the bath is a model of a person living a life in the world. You are busy. Things happen, you try to work them out, a lot’s happening at once, some of it incomprehensible. Only part of your mind can ever be on the experience because most of your mind is doing, making, acting. And without the thinking, meditative self it is finally just chaos: we must think. The book is a selective, ordered model of reality. It is easier to see here: things slow down; we can concentrate on one thing at a time. This may be the key aspect of reading and the reason that the read-aloud, shared reading we have developed over the past 13 years at The Reader Organisation, (whole books read aloud slowly over time in a group) is so powerful. It allows us to be here now, to keep a concentrated mindfulness going. If I were reading Middlemarch in a Get Into Reading group with other concentrated people, I would be getting a lot more out of it than I am on my sleepy own late at night. The next day when we are lighting the sitting room fire (coal, real fire, sticks and paper), Leo looks up and sees one of the brass cauldrons – notices it for what must be the first time. ‘Cauldron?’ he says, as if to himself. ‘Cauldron,’ he says again as if checking the brass reality with his mental image from the last night’s book. Then again, more confidently, he asserts: ‘Cauldron.’ reaching for it now. I can see he is remembering Meg and Mog. I observe his fingers touch the serrated edge. He looks at the coal and mis-guesses brilliantly ‘Coal-dron’. He’s not right but he is making his world, an active presence, made more active by the book. Making me more active, too: I do not know the etymology of ‘cauldron’. I look it up. What Leo has done: read a book, thought about it deeply, not really understood it all (because he did not know what a cauldron was in actuality) but he has got from that experience a template, a shape, a map, a set of pointers about life. Going back into life, he is able to recognise something he learned in the book (cauldron). He has been a creative reader and he has experienced a bigger reality because of the book. This is exactly what is happening, albeit in a more complex way, to me as I read George Eliot. That section about Tom coming home in The Mill on the Floss cleared a space in me and filled it with a thought-shape which was later filled out by Leo and cauldron. Books go forwards into our experience as well as backwards: they anticipate things you might know or understand later as well as things you know now, which is why we should all read books that are too hard or too old for us sometimes. The New Economics Foundation has formulated 5 Ways to Wellbeing. One of them is ‘Take Notice’. Books build our capacity to do that. I must make more time for reading.